Fast, easy charge from AC outlet. To charge, simply plug in unit. Battery does not need to be reomved to be charged. Lift will not operate while plugged in. 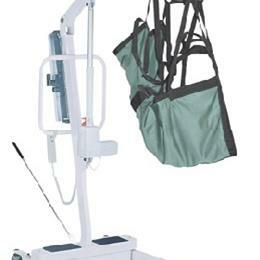 Jumbo actuator pump with emergency button can switch to manual mode lowers patient down safely. Audible warning when battery power falls below 50%. The "CHARGE" light will automatically shut off when battery is fully charged. Foldable mast and base for easy storage and transportation. For use with 4 point and 2 point slings. Wide base provides additional stability.